Roman province in southern Hispania, taking its name from the River Baetis, the Roman name for the Guadalquivir. 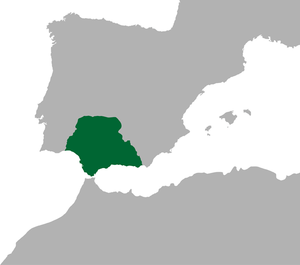 It was similar in extent to modern Andalucía,without its easternmost districts, plus southern Extremadura: its northern limit was the River Guadiana. It was formed when the province of Hispania Ulterior (Further Spain) was divided in 27 A.D., and was a prosperous, urbanised region. Corduba (Córdoba) was the capital. For judicial purposes the province was divided into four districts, the governor holding assizes in Corduba, Hispalis (Seville), Gades (Cádiz) and Astigi (Écija). Baetica fell to the Vandals in 411, and it may be that it was from them that the present name of Andalucía derives. After the Vandals had crossed to North Africa the Suebi controlled Baetica until the Visigothic Kingdom drove them out, mid-5th century. A century or so later (in 552) the Roman Empire, in the shape of Byzantium, returned to the coastal districts of the old province, while Córdoba became independent. The Visigothic Kingdom took Córdoba back in 572, and recovered the Byzantine coast in the first quarter of the 7th century. This entry was posted in Spain and tagged Écija, Extremadura, Guadalquivir, Hispania, Hispania Ulterior, Roman Empire, Seville, Visigothic Kingdom. Bookmark the permalink.